Personal Floatation Devices, or PFD’s, (some people still call these “life jackets”), are a necessity to any boating activity on the river. Any legitimate commercial rafting companies will provide you with a high-floatation PFD. Many commercial kayaking outfitters will allow you to wear your own, but will provide one if you don’t have your own. This is one of the biggest decisions. Many kayakers and raft guides prefer to wear a low-float PFD because it gives them more mobility. The floatation is measured in pounds and the lowest low-float vests have at least 15 lbs. High float vests are typically over 22 lbs and have a flap behind your head that will help to float your head if you are swimming. Some PFDs have the option of adding a high float component, or you can always get an NRS anti-gravity shirt with extra floatation. If you have specific rescue training in Swift Water Rescue and/ or are professionally guiding or running the gnar, then you should probably consider wearing a rescue vest. A rescue PFD has a quick release strap that can be used in rescue situations, a place to put a river knife, and sometimes other gadgets such as whistles and small throw ropes. If you don’t have rescue training, you should get it. Contact Sierra Rescue for Swiftwater Rescue classes and schedule. For a long time, all “life vests” were high profile, meaning that the jacket came up high under the arms and neck. 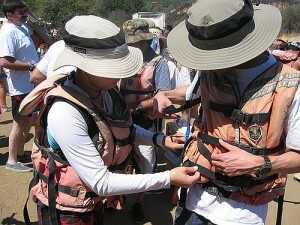 Most high-floatation vests are still designed this way, however, several “low pro” vests have come out that allow for more mobility and flexibility while paddling. Kayakers and raft guides seem to prefer wearing the lower profile vests. Astral Bouyancy: Made in Asheville, NC, these newer PFD’s have gained a great reputation in the boating community. They are made with eco-friendly materials, have a low profile, offer a women’s version, and they have a great rescue vest. Extrasport: A well-respected company that has been making PFD’s for over 25 years. They have a whitewater-specific one with all the standard rescue bells and whistles. They also make nice high-float jackets. Kokatat: Often considered the industry leader in PFD rescue technology, Kokatat, which is based in Arcata, CA, has been around for a long time and makes a wide variety of PFD’s. NRS: They make great high floatation vests. Most of their PFDs aren’t low-profile, but they tend to be fairly affordable. Stohlquist: Rescue and ladies’ specific PFDs are included in their extensive lineup.